… it gives me great pleasure to support the first ever publication to specifically address the area of research, and in particular its relationship with practice, in the discipline of architectural technology…not only ground breaking because it is the first book of its kind, but also because it provides at long last one of the accepted foundations needed to underpin the emerging academic discipline, namely a recognised research base. CIAT, in supporting this publication, is aware of the need for books such as this to sustain the process of research informed practice, as an aid for both students and those practising within the discipline of architectural technology. Architectural technology is the realisation of architecture through the application of building science, forming the constructive link between the abstract and the physical. Architectural Technology: research and practice demonstrates the importance of research in architectural technology and aims to stimulate further research and debate by enlightening, informing and challenging readers. 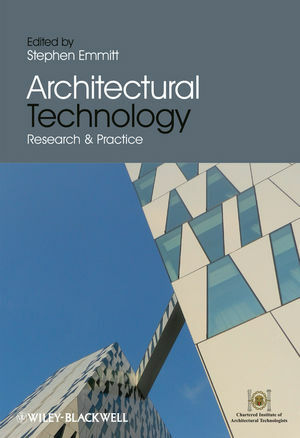 Chapter authors address the interplay between research and practice in the field of architectural technology, examining the influence of political, economic, social, environmental and technological issues. The focus throughout is on creating sustainable buildings that are constructed economically and function effectively and efficiently within their service life cycle. The book’s mix of chapters and case studies bring together a number of different themes and provides invaluable insights into the world of research from the perspective of those working within the architectural technology field - practitioners, academics and students. The underlying message is that architectural technology is not just a profession; it is a way of thinking and a way of acting. This is highlighted by contributions from architects and architectural technologists passionate about architectural technology as a field of knowledge. Contributions range from the theoretical and polemic to the pragmatic and applied, further helping to demonstrate the richness of the field. About the Editor Stephen Emmitt is Professor of Architectural Technology at Loughborough University UK and Visiting Professor of Innovation Sciences at Halmstad University, Sweden and a member of CIAT’s Research Group. Stephen Emmitt is Professor of Architectural Technology at Loughborough University, UK and Visiting Professor of Innovation Sciences of Holmstad University, Sweden and member of CIAT's Research Group.